If you want to do super-strength training, in order to avoid get hurting, you need a barbell pad. This barbell pad is made of 420D oxford fabric, which is tough and durable, with EPE foam padding, it's comfortable to use and helps spread strength out to protect you neck and shoulder from muscle strain. The loop and hook design ensures the pad wraps barbell tightly without any slippery. 1. More Comfortable: This shoulder support will cushion neck, shoulders and thighs against the heavy bar when doing squats, lunges and hip thrusts, which makes feel more confortable. 2. 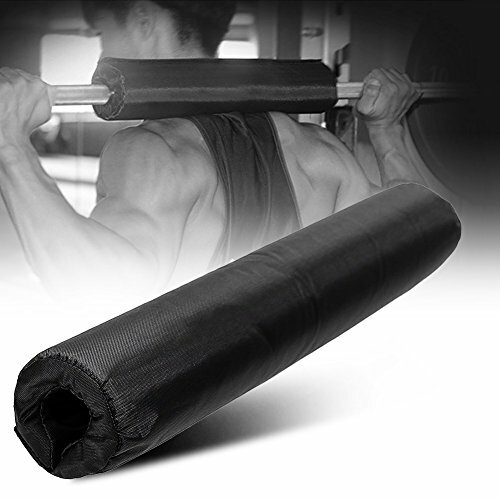 Long Time Lasting: Made of the 420D oxford fabric, our barbell squat pad is tough and durable for long time use. 3. Loop and hook design, it wraps barbell tightly for safe weightlifting. 4. Padded with quality EPE, not too soft, offers perfect protection for neck and shoulder. 5. Suitable for most barbells, a must for super-strength training like weightlifting.